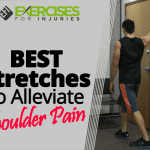 Today, I am going to talk about shoulder pain and offer a couple of quick and easy exercises that you can do to get rid of shoulder discomfort. If you have shoulder pain, watch the video and read the article below. If you know of someone who suffers from shoulder soreness, feel free to share this with them. In today’s video, I will go through a quick and easy shoulder pain workout. I got Alix to demonstrate. Grab a pull bar and hang from it. You can also use the top of a door frame to hang from in order to stretch out the shoulders. Grab something overhead that can handle your weight, bend through the knees, and stretch as much as you can in the shoulder. Start off with one set of 5 repetitions, holding for 5 seconds. You can progress to one set of 5 repetitions, holding for 15 seconds. If you have had your shoulder pain diagnosed as instability or sloppy shoulders, this would be an exercise that you should avoid. But if you have general shoulder pain and tightness, like a rotator cuff issue and shoulder impingement issue, this exercise should be fine. Move down to the mat and do this exercise from your knees. Go through a push up movement, straighten out, then add a little bit of a rounding movement. Do not collapse your head and round your chest. We simply want the shoulders blades to move apart, pushing the arms a little further apart and really working on the muscles called serratus anterior. Start off doing the exercise from your knees and then you can progress up to your toes. Do one set of 5 repetitions in a smooth controlled movement, and hold for one or two seconds at the end. Sit upright near the edge of a chair. Bring your arms to the sides, bring your seat off of the chair, and then lower back down with resistance from your arms. Pushing down brings the shoulder blade down and works the serratus anterior muscles. Start with one set of 5 repetitions in a smooth controlled movement, and hold the end position for one or two seconds. If you are suffering from any kind of shoulder discomfort and want to get rid of the soreness permanently, then click here to check out the Fix My Shoulder Pain program.